One of the more well known and, for that matter, controversial figures in American history is George Armstrong Custer. Obviously best known and written about for his demise at the Battle of the Little Bighorn, there are yet many who may be unfamiliar with his exploits during the American Civil War. It is with that perspective in mind that author Thom Hatch has provided a chronological account of Custer’s experiences during that pivotal period. More than just a short biography and tale of his camp life and combat trials, the volume also includes much in the way of personal information on him, and his thoughts and attitudes—particularly with respect to his courtship of and relationship with his wife, Elizabeth “Libbie” Bacon Custer. Indeed, the details behind this relationship provide much in the way of context and interest in this book, particularly as she defended her husband and his actions for the rest of her life, dying at age 90. The author employed a number of their letters to each other and excerpts from her diary to document how she was pursued by other suitors, overcame a potential rival for his affections, eventually became his sweetheart (in spite of playing hard to get initially), and fell into the union that soon flourished. For his part, it was necessary for Custer to overcome her father’s objections due to Custer’s lack of social standing and his being on the wrong side of the political spectrum. In the end, of course, love won out. Other lesser known facets of Custer’s personal life are also delineated: Relations with his family and the late war transfer to his command, from the infantry, of his brother, Tom, who was ultimately awarded two Medals of Honor for his exploits. All of this is seamlessly incorporated into the narrative as author Hatch recounts Custer’s actions and battles and the decisions behind them during the course of his meteoric rise from West Point “goat” (last in the Class of 1861) to Brevet Major General commanding a cavalry division in the Army of the Potomac by war’s end. It certainly didn’t hurt to have been mentioned in dispatches noticed by and receiving the sponsorship or mentoring of those in authority such as Generals George McClellan and Alfred Pleasanton. Regardless, Custer was different from many others in command positions as he not always led from the front but also seemed to lead a charmed life, escaping from harm in multiple incidents recounted in the book. Indeed, his life in the cavalry largely paralleled that of Confederate cavalry commander J. E. B. Stuart who also figures prominently in the narrative. If there is anything that mars this otherwise informative volume, it is a few errors of accuracy which, although not really germane to Hatch’s thesis, would seem to indicate perhaps a lack of familiarity with basic Civil War and 19th century American history or even insufficient or sloppy research. The biggest error was particularly glaring: Abraham Lincoln’s opponents in the election of 1860 were a “splintered trio of Democratic candidates—Dickinson, Lane, and Hunter.” (Page 18) John Breckinridge, Stephen Douglas and John Bell are the correct names and Bell was the Constitutional Union candidate and not a Democrat. As no first names are given for the former trio and they are not listed in the index, it is impossible to know of whom the author has written. The endnote in question lists two possible sources for the information. Consequently, someone is passing along incorrect information. Other errors are those of geography, “Ashley’s Gap” (Page 119) for Ashby Gap in the Blue Ridge Mountains, and military misnomer “Colonel William Gamble’s infantry.” (Page 172) Gamble was another prominent cavalry brigade commander during the war and did not lead infantry. Lastly, Oliver O. Howard was the commander of the IX Corps and not the VI Corps. (page 142) Admittedly, these mistakes are niggling yet annoying and could have been caught by a vigilant editor or fact checker. 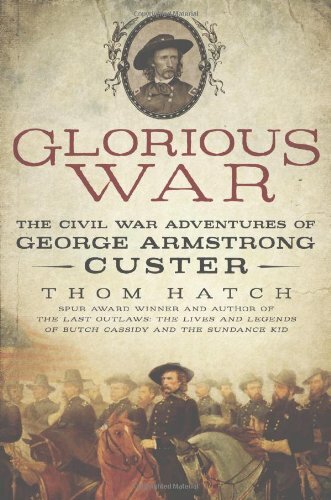 Barring these minimally intrusive mistakes in the text, Thom Hatch has written an enjoyable book, providing considerable information regarding Custer’s efforts to experience “glorious war,” satisfy his ambition, and make a name for himself. Although no maps are included, which could have provided geographical context with respect to his many locations and movements, there is a photographic section that primarily depicts many of the major players mentioned in the book. Using an extensive variety of primary and secondary sources in this book about a person who would seem to be his favorite American historical personage (he has published three other volumes on his protagonist) Thom Hatch has assumed a cheerleading mantle on behalf of someone who has been castigated many times for his actions in the post Civil War period. As far as Custer’s successful Civil War career is concerned, the author is justified and has made his point.